The Orphan Foundation of America does a really cool thing for kids in the foster care system that are going off to college...well they do many cool things but the one worth mentioning here on the blog is the Red Scarf Project. Each student receives a red scarf in the mail while away at school. These kids don't have parents sending them care packages and for Valentine's Day each student from foster care gets a red scarf to warm their hearts and necks. So all you crocheters and knitters out there reading the blog...pick up some red yarn and get to work! 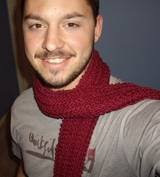 :) Scarves will be accepted from September 1st through October 15, 2008. And since this is a completely volunteer project, if you can , send them a little donation to help with the shipping of the scarves to the students. Guidelines, along with patterns and tags are on the site.